As we all know that Samsung is all ready to launch the Galaxy S10 series. We also know that Samsung will launch three different models including regular S10, S10 Plus, and S10 Lite or S10E. Samsung Galaxy S10E Official Renders were also Leaked a few days back with gave us some idea of the leaked specs including camera set up and fingerprint scanner. Now we have come across the Leaked Picture of Samsung Galaxy S10e which gives us a strange detail of the device. It was announced that the device will come with some extraordinary features at PKR 80,000 in Pakistan. Galaxy S10e will feature a 5.8 Inches Super AMOLED Screen. The handset will be protected by Corning Gorilla Glass 6. The phone will be powered by 3000mAh battery that will keep its lights on. In addition to that, the phone will come with 6GB RAM and 128GB of Built-in Storage. It will sport Exynos 9820 chipset. According to me, the phone is very ugly because of its Yellow banana kind of colour. According to rumours, this device will also come in green, white and black colour. 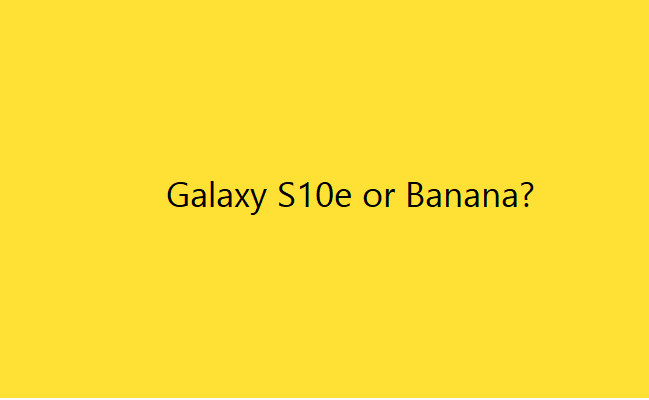 In that case, may by Galaxy S10e will not look ugly but right now its a big NO from me. Official details about the upcoming Samsung Galaxy devices will be revealed on Feb 20.